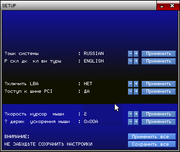 I have removed the old options for sound blaster, midi etc. Also options for time and date are removed, calendar seems a more appropriate program to change date and time. If you are opposed to these changes, or have more ideas, please tell me. 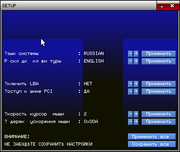 I plan to further update the program and store the settings in a ini file through libini. How about removing unused functions in the kernel? Removal from the SETUP is only half the job. Yes, it's the next logical step. First i'll modernize the setup program some more. What system functions are we talking about? I have searched for the number 58 in the entire program code repository and have not found it once. So if the C library is also equipped with the newer function 70 (wich i believe it is), it is time to remove it once and for all. Because it old. If it will be updated, it will be usefull. Some parameters has not used, but keep the order of the parameter has always needed. Fixed to SVN r. 2319. Another way is to change setup.dat, but it may require effort to edit a dependent nightly builds. Did not notice that, sorry. I have already designed a new version wich uses .ini file (through libini) to store settings. Also the gui has been updated. I found 2 bugs in NB SVN#2474 (real iron). 1. Wrong text displayng (Very old bug). В топку этот стиль окон - я бы его вообще выпилил из ядра, поставив заглушку для совместимости. А причем тут стиль окна? Стиль окна стандартный. А градиентная заливка это стандартная фича. 2. Она отстойная в принципе.